October 15, 2016—Hi, my name is Audrey Mason. I have been an active off-roader my entire life. I currently ride a Honda 400EX, and cruise in a YJ jeep with my husband K.J. Mason. I was introduced to San Diego Off-Road Coalition (SDORC), a non-profit political coalition of volunteers dedicated to protecting and preserving off-roading, through our family Rob and Kathleen Smith. The Smith’s are long-time active members of SDORC, coordinating large events, raising awareness and spreading the word of important current issues and top legislation endangering our off-roading lifestyle. This includes issues such as land closures, lawsuits and potential endangered species; most issues that off-roaders are facing and are largely unaware of. I began to understand the importance of what they were fighting for when it finally affected me personally in 2012. One of my favorite parts of Ocotillo Wells SVRA that I grew up going to with my dad closed in 2012, and added to Anza Borrego designated trails only due to an endangered plant. I joined SDORC to fight back against losing our American right to USE public lands. Now, please don’t take me the wrong way; I deeply care about Mother Earth and strongly believe in not leaving any trash behind. But one of the most important parts of off-roading is enjoying the beauty of the outdoors, experiencing parts of the world that 95% of the world will never get to see. Not to disturb it or leave a trail of my own, but to take in the incredibly spectacular beauty and natural wonders of the world. Yet sadly most places you cannot off-road to anymore. Whether it be a single track, or a route wide enough for a 4-wheeler to enjoy, the sad truth is that, if we haven’t already been banned with a gate installed to keep us out, there is limited use on designated trails only or the location is currently facing further trail closures. Unfortunately, most off-roaders are naive to the strong opposition we face against several environmental organizations trying to close access, gate off or limit use to trails only, stating “off-roaders cause serious damage to natural and cultural resources requiring further protection management.” Next thing you know there’s a lawsuit filed by Center for Biological Diversity (CBD) to close another part of our precious open public lands. Not only does this affect our deserts, but also wilderness, forests and beaches. As off-roaders, hunters, hikers, rock climbers, horse back riders, river rafters, fisherman, mountain bikers, outdoorsmen or “hunter gatherers” as I call us, please unite together and stand up for our right to use public lands. Stand Up, Unite and Fight For Our Off-road Right. 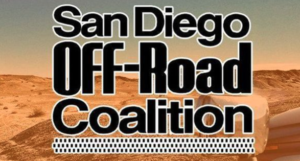 Join the San Diego Off-Road Coalition.